Harvey, Irma, Jose, Maria: we wish we had never met them. All of these hurricanes have made landfall with severe or absolutely devastating impacts in the Caribbean and United States this year. This fall has been a remarkable season in terms of the sheer number of places that have experienced direct hits by Category 5 storms (the most powerful on the Saffir-Simpson Hurricane Wind Scale). If the trend continues, such storms will become more common in the future, not only in the tropics but also here in the Northeast. With them will come severe winds, damaging salt sprays, and heavy rains. How will this affect us in the city? What can we do about it? Looking at recent storms can give us insight into both questions. 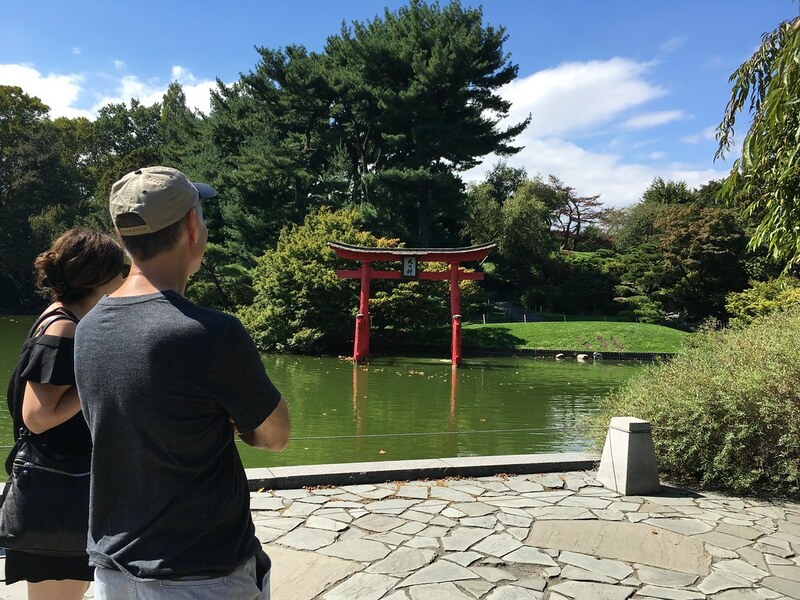 Urban green spaces like Brooklyn Botanic Garden are vulnerable to storms, but they can also mitigate damage, especially when green infrastructure is incorporated into the grounds. Our biggest storms tend to occur between August and October, with some hitting as early as June or as late as November. Not coincidentally, this corresponds with the official hurricane season in the tropical Atlantic Ocean, the Caribbean Basin, and the Gulf of Mexico. When we see a Hurricane Sandy or a Tropical Storm Irene that has traveled to New York from southern origins, the connection is obvious. Such storms have retained the physical structure of tropical systems. This differs from the structure of “mid-latitude” storms that typically arrive from the west or southwest. However, even mid-latitude storms can be influenced by the tropics. In fact, the largest ones typically gain moisture and energy from warm ocean waters as they travel off the Southeastern Seaboard, before heading up the East Coast. At other times during its journey northward, a tropical storm can take on the structural characteristics of a mid-latitude storm or actually combine with a mid-latitude system. These are called transitional storms, and though they are typically weaker than purely tropical ones, they can retain much more moisture and energy than most mid-latitude storms. All three types of storms—tropical, mid-latitude, and transitional—have the potential to become nor’easters along our coast. These storms don’t come from the Northeast as many people assume—the name is actually a reference to the direction from which the storm’s wind blows due to its counterclockwise wind pattern. Even when the tropical influence is not obvious, the physics of the climate system dictate that our rainiest and windiest events are influenced by tropical activity. A number of research publications, including some of my own, indicate that between the mid-1990s and 2012, our regional hydrological cycle involved more storms and floods than at any time since we began making standard meteorological measurements in the late 19th century. And if data inferred from tree rings is taken into account, this is probably the stormiest, wettest period in the last 500 years. The impacts of these storms on plants and gardens can be varied and sometimes unexpected. On October 29, 2012, many New Yorkers heard the term “storm surge” for the first time when seawater from Hurricane Sandy inundated low-lying homes, streets, and parks along the coast. The salty water was poisonous to many maladapted plant species in areas such as coastal Long Island and along the shores of the East River. Even Brooklyn Botanic Garden, several miles inland and on higher ground, was hit with salty sea spray. The impacts of saltwater can take a long time to manifest, and some trees at BBG are only now, a full five years later, being scheduled for removal. The brown tree in the photo below is an Austrian pine in the Japanese Hill-and-Pond Garden that was damaged by salty sea spray during Sandy. Long Island also suffered a lot of tree damage. 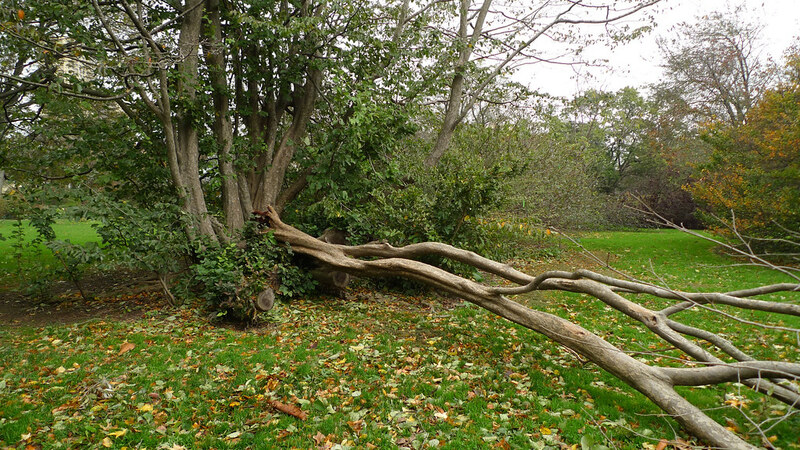 Storm winds also pose obvious hazards for flora in urban green spaces like Brooklyn Botanic Garden. In August 2011, Tropical Storm Irene slammed into Puerto Rico and then up the U.S. East Coast, dropping heavy precipitation along the way. Although it weakened to tropical storm status by the time it reached New York, extreme rainfall continued in many areas, including the Catskill Mountains, the source of our water supply. Many New Yorkers remember Irene as a false alarm because this extreme rainfall event bypassed the city. But its winds caused a lot of damage. At BBG, approximately 100 trees were taken down, including the last large American elm in the Garden. These sorts of disturbances provide opportunity for forest renewal and succession in natural areas, but botanic gardens and other managed urban green spaces aren’t designed to be resistant and resilient in the face of such events. As discussed in my previous blog, resilience can be defined as the capacity to recover quickly from difficulties, while resistance refers to the ability to remain either unaffected or to be positively affected. At BBG, the Native Flora Garden, the area most similar to a natural ecosystem, has been the most resistant and resilient to disturbances from Irene, Sandy, and similar storms. In addition to wind, major storms also bring intense rains. Here BBG is less vulnerable to damage and actually plays a role in making the city more resilient. One of the city’s key vulnerabilities is combined sewer overflow (CSO). As is typical for older cities, the sewage pipes underlying most of New York City handle both sewage (from buildings) and storm water (from streets). The pipes are built to handle a flow to match the capacity of our wastewater treatment facilities, of which there are 14 across the city. On most days, the infrastructure can easily handle all the sewage, and only treated water is released into the surrounding rivers and ocean. During large storms, however, the peak flow rate through the pipes exceeds treatment capacity, which results in the overflow gates opening and releasing a combination of storm water and sewage directly into the water. This is why after large summer storms, swimming is sometimes prohibited at our beaches. CSOs are a significant source of pollution and cause ecological harm to the waterways. During storms, BBG’s grounds and other unpaved, vegetated land can absorb much of the rain, allowing water to flow into the sewage system more slowly, diminishing the magnitude and duration of CSOs. The Garden’s Water Recirculation Project, under construction, actually goes much farther than that. This is a wonderful example of green infrastructure, by which natural features are used either instead of or in conjunction with high-tech and traditional civil engineering strategies to reduce environmental impacts. The main component is the Shelby White and Leon Levy Water Garden, designed by Michael Van Valkenburgh Associates. The garden’s pond and brook system, along with a small wetland and riparian environment, promote more rainwater absorption and a slower flow rate. More than 20,000 new plants were planted around the garden, made up of species chosen for their ability to absorb water and filter contaminants. A rock and soil weir filters water and regulates pond depth. When the project is completed, an underground pump system will recirculate water back uphill to the Japanese Hill-and-Pond Garden. To further diminish peak flows during storms, the pond can be lowered in advance of major rain events. The system is designed to automatically lower the pond level based on weather forecasts, capturing the rain rather than allowing it to run directly into the sewage system. The Water Garden is expected to prevent approximately 21 million gallons of storm-water flow each year. While this sounds like a lot of water, it is, pardon the pun, a drop in the bucket compared with the total volume of the city’s sewer system. But perhaps in the long run, even more important than the Garden’s hydrological impact is its potential for educating the public about these issues. Scientific best estimates also suggest that our region is likely not only to experience more and larger storms but to be wetter in general. Excess rain can also present challenges even when unrelated to storms. 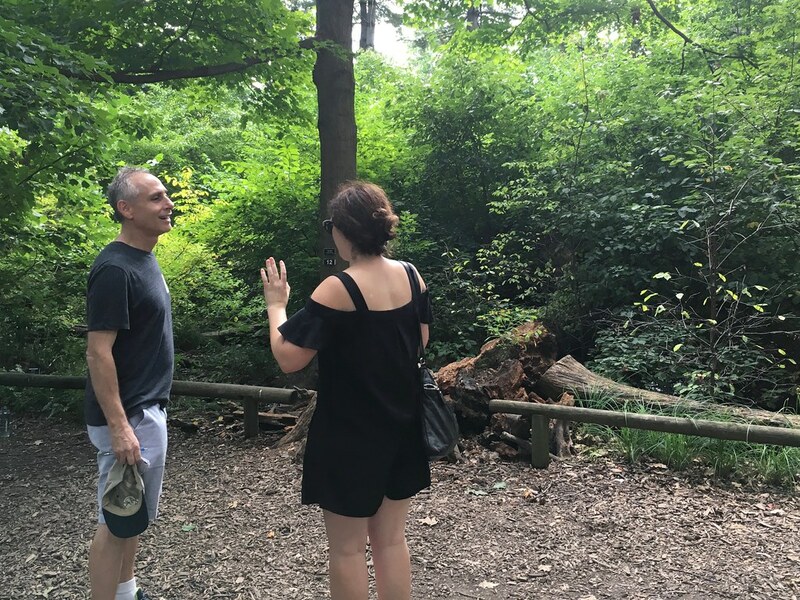 This year’s unusually wet summer, for example, resulted in more weeds and nutrient deficiencies as well as brown rot in some plants at Brooklyn Botanic Garden. It also led to fungal and bacterial diseases in the Rose Garden, powdery mildew on the lilacs. It was also bad for species at BBG that are adapted to the dry summers of Mediterranean climates. In the first paragraph of this blog, I said, “If the trend continues,” but what do we really know about future trends? There are many unknown factors that will determine exactly what combination of storms, excess rain, and other weather changes materialize, but we hope that educating the public about all these issues can help make our city as resilient as possible. Some New Yorkers have already heeded the wake up call from Hurricane Sandy. The more that citizens recognize the importance of endeavors like green infrastructure, the more likely society is to employ them. Allan Frei is a professor specializing in climatology in the Department of Geography at Hunter College, City University of New York, and deputy director of the CUNY Institute for Sustainable Cities. His recent projects include collaboration with the New York City Department of Environmental Protection on its project to evaluate the potential impacts of climate on the city’s water supply system. 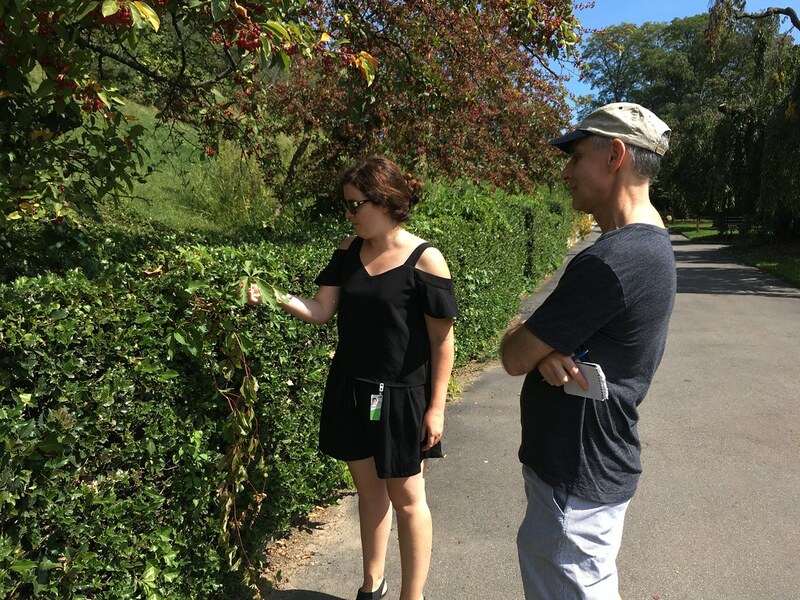 Melanie Sifton, Brooklyn Botanic Garden vice-president of Horticulture, points out brown conifers damaged by saltwater spray during Hurricane Sandy to climate scientist Allan Frei from Hunter College. Photo by Sarah Schmidt. Frei and Sifton discuss storm damage in the Native Flora Garden. Here trees that fall during storms are sometimes left to decompose as part of the natural succession process. Photo by Sarah Schmidt. 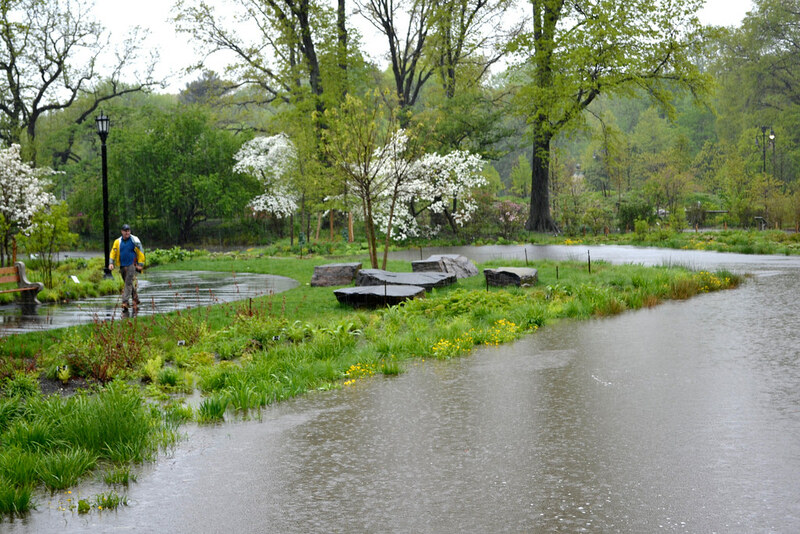 Brooklyn Botanic Garden's collections suffered storm damage from Hurricaine Sandy. Photo by Uli Lorimer. Wet weather allows plants like poison ivy and Virginia creeper to proliferate. Photo by Sarah Schmidt.